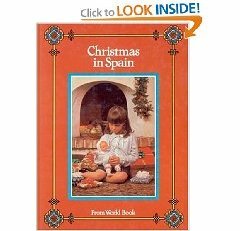 Acknowledgement: Recipes from CHRISTMAS IN SPAIN © 1996 World Book, Inc. © 1983 World Book Encyclopedia. By permission of World Book, Inc. www.worldbook.com. All rights reserved. In a saucepan, heat water and sugar until sugar dissolves and mixture begins to boil. Let it boil steadily without stirring the temperature reaches 230-234 degrees F on a candy thermometer. Remove from heat and beat until mixture turns slightly cloudy. Stir in ground almonds, egg whites, and vanilla. Cook over gentle heat for 2-3 minutes or until mixture pulls away from sides of pan. Turn mixture onto a surface that has been sprinkled with some of the powdered sugar. Knead the mixture until smooth, working in the rest of the powdered sugar. Pull off pieces and roll into balls or olive-shaped pieces. Wrap in foil or wax paper and store in airtight container. Preheat oven to 375 degrees F. Roll pastry thin and cut into 4inch circles. Fit each round into muffin cup and press in gently. Beat eggs until they are light; add sugar and mix well. Add butter, salt, and vanilla; mix well. Combine walnuts and raisins and fill each cup 1/2 full. Add egg mixture to fill each cup three-quarters. Bake filled cups 20-25 minutes. Break chocolate into small pieces. Place in saucepan with liquid. Heat slowly, stirring with a whisk, until just before the boiling point. Dissolve cornstarch in a few tablespoons of cold water. Add dissolved cornstarch to chocolate mixture and stir constantly until the liquid thickens. Serve hot in warmed cups. Preheat oven to 325 degrees F. Lightly toast almonds; set aside. Beat egg whites until stiff but not dry. Gradually add sugar, beating constantly. After sugar is added, beat 5-8 minutes. Fold almonds and vanilla. Place by spoonfuls or shape into rings on greased cookie sheet. Bake 17-20 minutes or until cookies just begin to color. Saut‚ garlic in olive oil for 2 minutes, stirring. Add beans and cook 4 minutes, stirring constantly. Stir in tomatoes with liquid from can and remaining ingredients; bring to a boil, stirring constantly. Reduce heat to low and simmer 25-30 minutes. Remove an discard bay leaf. Serve at once. Peel and core the pears. Place in pot with remaining ingredients and bring to a boil. Cook 10-15 minutes, until the pears are very soft but still hold their shape. Serve warm or at room temperature with some of the cooking syrup. This cold rice salad is a modem variation on traditional Spanish ingredients. Bring 2 cups of water to a boil. Add salt and rice; cover and cook slowly 20 minutes or until rice is just tender. While the rice is cooking, make vinaigrette sauce by combining the olive oil, vinegar, garlic, and onion. Season to taste with salt and pepper. Spoon rice into serving bowl. When cool, cover and chill thoroughly. Decorate the top with the reserved pimento strips and olives.